New England Patriots quarterback Tom Brady celebrates with his teammates after the AFC Championship NFL football game on in Kansas City, Mo. 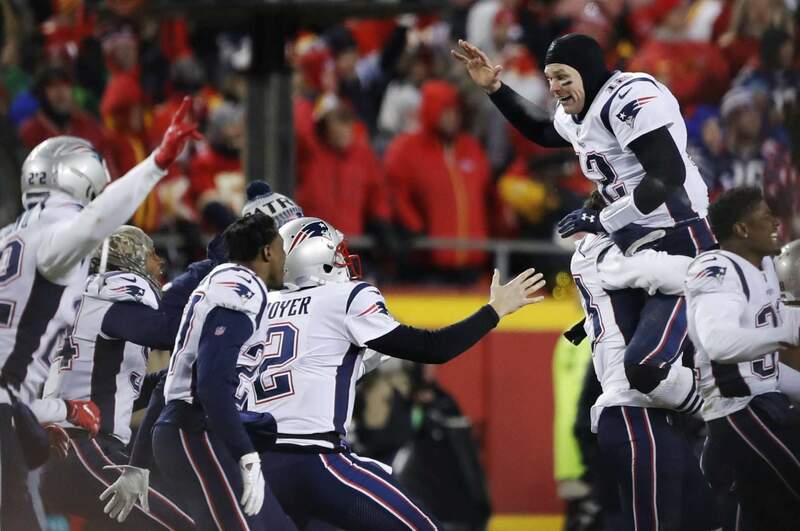 Sunday night’s game between the New England Patriots and Kansas City Chiefs was the second-most watched and rated AFC championship game in 42 years. The overtime thriller on CBS averaged 53.919 million viewers, just shy of the 54.850 million that viewed Pittsburgh’s victory over the New York Jets in 2011. The 27.5 household rating fell short of the 2016 matchup between New England and Denver that had a 29.3 rating. Sunday’s game is also a 22 percent increase over last year’s game between the Jacksonville Jaguars and New England Patriots, which averaged 44.145 million. Fox’s telecast of the NFC championship game between the Los Angeles Rams and New Orleans Saints had a 24.6 rating. The game averaged 44.218 million, which is up 14 percent over last year’s game which saw the Philadelphia Eagles beat the Minnesota Vikings (42.408 million). Both games had 13 percent rating increases over last year. This year’s 10 playoff games have averaged a 19.1 rating and 34.584 million viewers. The rating is up 11 percent over last year while the average audience has increased 12 percent.